A series of articles to select the Top 100 Collectible Children’s Picturebooks, providing the rationale for each book’s inclusion, with an objective of providing readers with the context for valuing first editions within the genre. Within the hobby value is a combination of scarcity and collectibility: very scarce and very desirable lead to very valuable. Scarcity is a function of the number of copies in the first printings and the subsequent attrition over time due to natural causes. Collectibility is more elusive, outlined heretofore as a complex intermingling of eight rated factors. 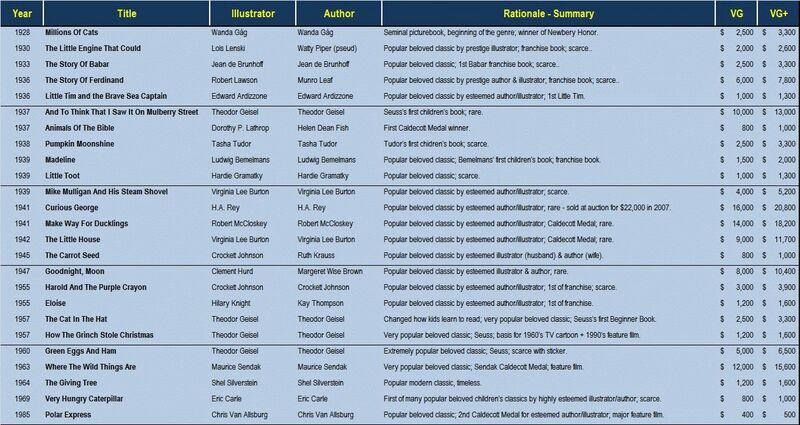 The Top 100 Collectible Picturebooks was put together in a sequence of partially logical steps. Clearly a sequence of partially logical steps is logically no different than partially illogical steps. Suffice it to say the following sequence of steps segments the Top 100 into smaller digestible bites. Selecting the Top 100 Collectible Children’s Picturebooks in one undertaking is overwhelming, both for the selector and for the reader. "Each is a high quality story with imaginative or inventive illustrations, […] the books have stayed in print since their original publication and gone into many, many printings. Many of the books have earned a children’s picturebook award, while many of the illustrators have won numerous awards. All of the illustrators have high esteem within the book publishing market place. Many of the book’s characters became franchise characters, […] and many of the books or characters have crossed over into pop culture, either via a TV or feature film adaptation." The following chart provides a single line summary of the rationale for the book’s selection, along with the estimated market price. The market price is for the first edition book with the corresponding first edition dust jacket, both in Very Good or VG+ condition. The list is sorted in chronological order. The Story of Babar (1933) was originally published in French; the issue referenced in the table is for the English language translation published by Smith & Haas. Similarly Curious George (1941) first made his appearance in the 1939 French book Rafi et les 9 Singes (1939) which was translated and published in the US as Cecily G And The 9 Monkeys in 1942. A very nice first edition Curious George sold in 2007 for $22,000 at a PBA Galleries auction. Of the Marquis 25, Animals Of The Bible (1937) is the least embraced book by the general public. The illustrations appear dated and the story, Bible passages selected by Helen Dean Fish, don’t capture a young child’s attention. Ironic that the book awarded the first Caldecott Medal, honoring the most distinguished picturebook published in America, is nearly not a picturebook by the classical definition. Although clearly Animals Of The Bible belongs in the Top 100, I waffled over putting the book in the Marquis 25. The significance of the Caldecott Medal to the picturebook collecting hobby weighted the scale in favor of its inclusion. While winning the Caldecott Medal contributed heavily to Animals Of The Bible inclusion in the Marquis 25, it did not influence as much the selection of the four other award winning books on the list. Make Way For Ducklings(1941), The Little House(1942), Where The Wild Things Are(1963), and Polar Express (1985)each have strong other merits. Polar Express (1985) is the only book published since 1980 to make the Marquis 25. Polar Express and Van Allsburg’s Jumanji (1980) his other Caldecott Medal book, were two of the three books published since 1980 to make the Top 100. Eric Carle’s The Very Hungry Caterpillar (1969) and Shel Silverstein’s The Giving Tree (1964) are two contemporary classics which justifiably make the Marquis 25. While neither is the first book by the illustrator, the enormous success of each book propelled the creator’s career. Carle and Silverstein later became staples within the children’s picturebook market. Even without consideration of their contemporary publications, first edition copies of The Very Hungry Caterpillar and The Giving Tree are difficult to find. Some may be surprised to see The Carrot Seed (1945) in the Marquis 25. The story is a children’s classic, and was one of the first book’s produced by the husband & wife team of Crockett Johnson and Ruth Krauss. Johnson’s popularity would skyrocket a decade later upon the publication of Harold And The Purple Crayon (1955) and the subsequent books in the franchise, while Krauss later authored some wonderful classics illustrated by Maurice Sendak before he rose to great fame. r holdings. This is either due to the library not caring whether their copy is a first edition, or not knowing whether their copy is a first edition. While not rare, several of the Marquis 25 are scarce in first edition. Collecting first edition contemporary American picturebooks is a fairly young hobby, without a high number of participants, and without much notoriety in the general population. Most people do not realize contemporary picturebooks have any value. As the hobby matures and the value system becomes somewhat stable, more people will enter the hobby, causing more booksellers to add contemporary American picturebooks as a focus area. Four Dr. Seuss books are in the Marquis 25, his first children’s book And To Think That I Saw It On Mulberry Street, along with three other of his most popular classics Cat In The Hat, How The Grinch Stole Christmas, and Green Eggs And Ham. Green Eggs And Ham was the fourth Alltime Bestselling Children’s book according to Publisher’s Weekly. Due to their high collectibility and relative notoriety among general antiquarian booksellers, several of the other Dr. Seuss first edition books are more valuable than many of the Marquis 25. Value was not the determining factor for inclusion in the Marquis 25. Referring to the original article in this series, I rated each book across eight different, but related factors. The chart, above, provides a single line summary of the rational for the book’s selection in the Marquis 25, a simple topline synthesis of the ratings. The following chart provides the 1-to-10 rating I gave each book along each factor. The market price is for the first edition book with the corresponding first edition dust jacket, both in Very Good or VG+ condition. The list is sorted in chronological order. 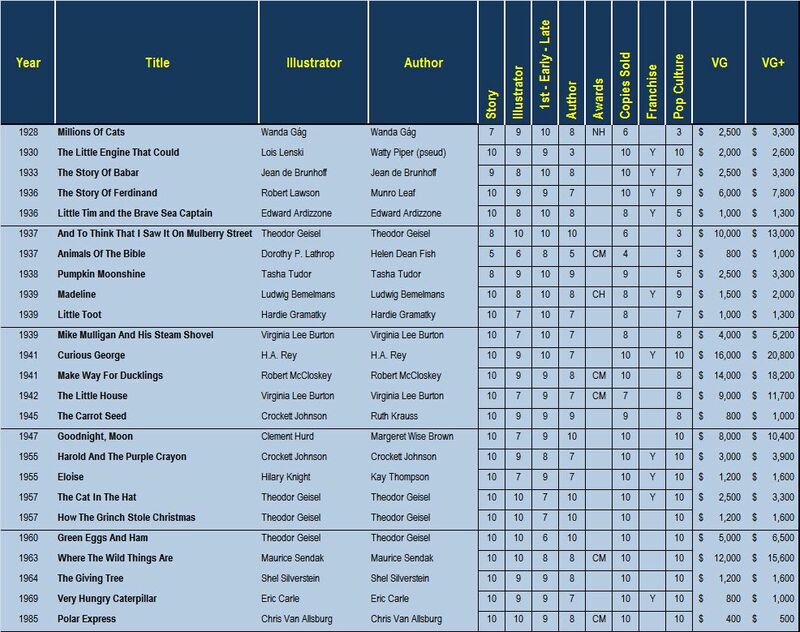 Over the course of the next couple of articles, as I build the list of the Top 100 Collectible Picturebooks, I will provide two charts similar to the above for each portion of the list. The first chart will provide the one line summary rationale for the book’s inclusion, and the second chart will provide the 1-to-10 rating along each category. In the ensuing discussion, the reader will become acclimated to some of the objective information I used to give the subjective 1-to-10 rating. The next article in the series will discuss The Nearly No-Brainers. I am trying to find some information on rough estimation value of a book I have “Make Way For Ducklings” by Robert McCloskey it is a 1941 Viking Press Date with Robert’s signature under the duck on the main page. The next page has first publish date 1941 second print November 1941 Third print May 1942. The book is rust cloth with a duck in the right hand corner and is in beautiful shape, the comers sleeves of the cover has about an inch torn on two of corners and wearing all around. It has two of the medals off to the left of the book cover. I can not find any of these for sale, I have found one in a preserved library but that is it. Can you help me please?